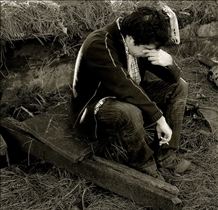 Depression is a condition in which a person feels emotional distress such as hopelessness and unhappiness. Sometimes depression occurs for little or no reason. Other times depression is brought on by life events. People can experience depression and anxiety at the same time. Anxiety is a disorder in which a person feels panic and fear or general anxiety during situations that would not normally elicit such a response. For example, if you were faced with a ferocious tiger, anxiety would be a normal reaction. Standing in line to purchase a movie ticket should not bring about anxiety. People who are depressed typically have low energy levels and often feel overwhelmed by normal daily events. It is difficult for most depressed people to maintain personal relationships and very often experience a prolonged feeling of sadness. Anxiety sufferers go through periods of sudden attacks of panic and anxiety. These attacks are not normally triggered by any type of situation that would require the fight-or-flight sort of response. People who experience panic attacks have difficulty maintaining relationships as well and some people cannot even leave their homes. There are many wonderful treatments available for depression. Antidepressant medications and therapies can be prescribed to patients suffering from depression. When a person becomes depressed due to a life event, it is often most helpful for that person to receive a type of therapy where they can deal with the issue. Long-term medication use is often prescribed for persons who have depressive disorders that are brought on by other factors than life events. Anxiety disorders are also treated with medications when indicated, and behavioral modification therapies are often very helpful. When people are chronically panicked, it is difficult for them to carry on day-to-day activities and must maintain their daily lives by use of exercise and relaxation techniques in addition to medication in order to manage. People who live with depression need to understand that there is help for the condition. Accepting treatment is very important to recovery. Many times depressed people feel that they are failures or are just being emotionally weak. Understanding that depression is a true medical condition that requires treatment is a vital step in the process. Living with anxiety disorders requires the same type of care as a depressed person. In fact, long-term anxiety can lead to depression. Accepting the treatment options and finding a support team that can assist you in your recovery process is fundamental. Depression and anxiety are common medical conditions that can be experienced by any person, at any age, for a multitude of reasons. While depression and anxiety symptoms can be brought on by many reasons, sometimes these challenges occur for no reason at all. Recognizing the symptoms of depression and anxiety is very important as the risk of suicide and other self-harming behaviors can occur if left untreated. Changing your mindset about depression and anxiety will increase your chances of recovery from depression and anxiety. Depression and anxiety receive the same kind of care. Anxiety can eventually lead to depression. Which mental health condition is more common? Anxiety is as a panick attack that comes on where the person has no control of they feel helpless and they need something that will calm them down and apparently that's where some medications help with that condition. I in the last 10 years while I was working never took medications and not even a aspirin. As I lost my job after 10 years it seemed that things were crumbling down on me and had no control and anxiety played a major role. I think I have been depressed for about 40 years but society brands people that admitted being depressed as crazy so a lot of people dealt with it on their own and mine do get pretty bad because I am disabled.